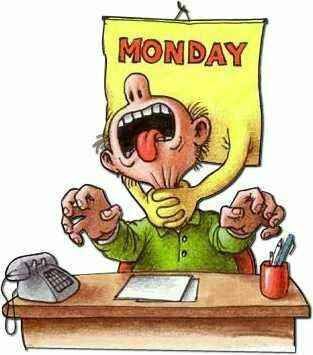 Why do Mondays get a bad rap? It appears that many people struggle with getting up and getting moving on this first day of their work week. They wish to still be relaxing on Sunday, doing what makes them happy. Not too long ago I struggled with Mondays as well. It was difficult for me to go from ‘lounging’ to ‘rushing’ overnight. I would wake up on Monday morning excited about the new day. However, I felt overwhelmed that I had to get two children under 5 yrs. old dressed, feed, and make sure all hair, teeth, and bodies were clean, my darling Dave’s lunch made, and that I looked professional and pulled together by 9:00am. My Monday’s ‘to-do’ list was filled with deadlines, appointments, and projects that set me up for failure at the end of the day. I didn’t like starting the work week off this way. I needed change! After making minor changes to my schedule and Monday’s ‘to-do’ list, I started enjoying Mondays more. With the simple alterations to my Mondays, I was able to reduce stress and create a less-hectic work week. Everyone in my life benefited from these changes…my children, spouse, business clients, family and friends. Here are a few steps I took to escape from my Manic Mondays. It is amazing how altering my Monday’s schedule to eliminate or minimize what overwhelmed me has greatly improved my productivity for the rest of the work week. I encourage you to take a good look at your Monday schedule and ‘to-do’ list and see what steps you can take to simplify & thrive. It will lead to a happier, more efficient YOU! For more tips and ideas on simplifying your world, visit my website at www.YourEfficiencySpecialist.com. While there, I encourage you to sign up and gain access to my ‘Organizer’s Tool Bag’ which is filled with even more great ideas for simplifying your life.